On these chilly days of January, nothing warms you up quite like pizza coming out of an 800 degree oven. Enter Pizza Moto, authentic Neapolitan wood-fired pizza. Pizza Moto has made its name in the 5 boroughs for serving bubbly char-kissed pizza from hand-made mobile ovens. Pizza Moto is located on the north side of the Fountain Terrace. 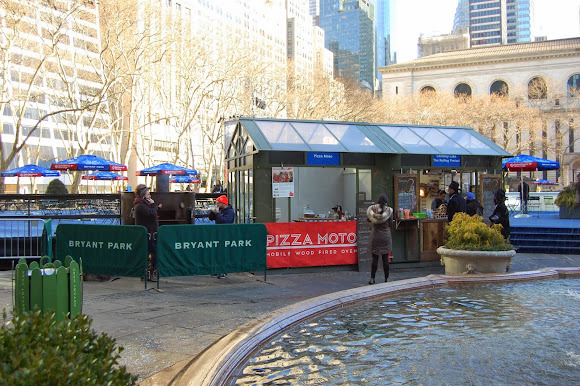 To the left of the kiosk, behind the Bryant Park barricades, is the mobile pizza oven. The pizzas come in a variety of flavors and are made to order. The mobile pizza oven is 800 degrees Fahrenheit. The oven is so hot that the pizzas only cook for a minute. The Boscaiola pizza features mushrooms, basil, fresh mozzarella, red onions, and spicy tomato sauce. The crust is delightfully thin and crunchy, and blistered to perfection. The Fungi pizza features three cheeses and fresh mushrooms. The flavors are an incredible umami combination.